Shakespeare’s Collected works were published in 1623 mostly to make sure that they would continue to survive for the edification of posterity, but also, I suggest, to put to rest continuing questions about their authorship. There is no direct evidence that questions were being asked before the publication of the First Folio, but if our scenario is correct, common sense tells us that it must be so. As Ramon Jiménez shows, those who would have known who Shakespeare was would have constituted a very small (and silent) minority, yet the popularity of his plays had to have raised questions. Shakespeare experts are not inclined to show the world the kinds of problems that surround the publication of the First Folio. Among these are the dreadful nature of the portrait engraving that we’re supposed to accept as a believable image of the great author. What residual respect we might retain for the advocates of the Stratford biography must lessen considerably when we consider the peculiar nature of the First Folio frontispiece. That this dreadful image was due to bad draftsmanship won’t wash, not for anyone who has seen the engraved frontispiece portaits of authors like George Chapman, Mary Sidney Pembroke, or Ben Jonson. 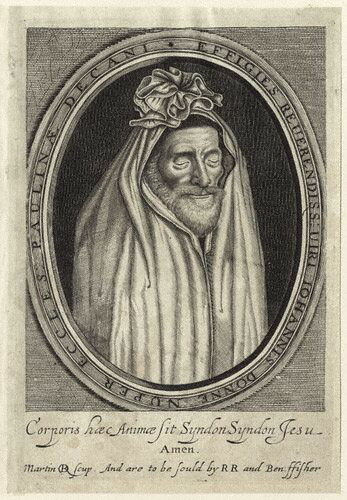 The caveat that the artist, Martin Droeshout, was incompetent is belied by the quality of his fourteen other portrait engravings in the NPG, among them this gem of the funerary figure carved by Nicholas Stone of John Donne, wrapped in a shroud. Droeshout was perfectly capable of creating a believable human image, had that been the request. Another glaring problem is the ambiguous nature of the dedicatory Ode by Ben Jonson, which has presented problems for Shakespeare scholars for centuries. What did Jonson mean by “small Latin and lesse Greek”? Why such a peculiar emphasis on “envy” at the start? Why such a detailed denial that he was buried in the Abbey? What are we meant to read between the lines of Jonson’s Ode? That William spent very little time in London is shown by how few records there are of his presence: there is one, and only one. (The tax records of his presence in St. Helen’s parish suggest only a very temporary stay.) For some time around the turn of the century, he resided with the Mountjoy family on Silver Street not far from where John Hemmings was living (adding weight to the likelihood that it was Hemmings’s job to deal with him). In 1612 William was called to London to testify at a hearing dealing with the 1604 marriage of the Mountjoy’s daughter to one who was their apprentice during the time that William resided with them. William deposed that he had known Bellott for about 10 years, which puts their connection to roughly 1602. Later when asked to return to London for further questioning, he did not respond (Schoenbaum 213). His signature on the deposition––“Willm Shakp,” partially covered with an ink blot––is one of the six signatures, the only evidence of writing that we have from his hand. In the deposition William is termed a “servant,” of the Mountjoys. The word servant was used more loosely then, simply meaning one who is willing to serve, or be helpful to another (not necessarily being paid for it). Even so, it seems an odd term to use for the leading playwright of London’s top theater company vis a vis their hairdresser. In the deposition William is given the honorific “Gent.” that he adopted in 1596 after having obtained the coat-of-arms. At one point in the deposition he is described as “one Mr. Shakespeare that lay in the house,” of the Mountjoys, which does not suggest any kind of permanent residence. It’s clear that by 1612, when the deposition was made, he no longer had a room at the Mountjoys. I suggest that there was an arrangement made with the Mountjoys by Hemmings that William would room with them when he came to town, any charges paid for by the Lord Chamberlain’s Men. As wigmakers, the Mountjoys could have been providing the Company with costume wigs, which Hemmings, as business manager, would have been responsible for ordering. This is the only solid record of William’s actual involvement in any event during the period that he was spending time in London. The 17th-century playwright and theater manager Sir Willliam Davenant got a lot of mileage out of his boast that he was the illegitimate son of William Shakespeare. This is one of those anecdotes that may have some basis in fact. Davenant, who according to the scholars, was born in February 1606, claimed (according to Samuel Butler, John Aubrey, and Anthony á Wood) that he was the product of a fling that his mother, the attractive wife of an Oxford innkeeper, had had with Shakespeare. Since the city of Oxford was the logical halfway point on the two-day trip from Stratford down to London, it’s altogether possible that on his trips to and from the City it was William’s habit to stop over at the Davenant’s inn. And that William, freed for a time from his duties as husband and father, got it on with the innkeeper’s wife, is certainly well within the realm of possibility. It’s nice to think that William, in the prime of life and exuding the confidence of an up-and-coming entrepreneur, was found appealing by this vivacious lady. We prefer to believe that William kept his vow of silence even in the privacy of the boudoir, and that the doting mother only realized some time later whose son she had borne when the name William Shakespeare as the best of London’s playwrights finally found its way to their tavern. That she let her son know at some crucial point in his development that he was the son, not of a mere innkeeper but of a famous playwright, is another pleasant possibility. And that this was the basis for Davenant’s interest in the theater and his rise to importance––he was named England’s Poet Laurette after Ben Jonson’s death (to be followed in that office by the great John Dryden)––also seems not only possible, but altogether likely. The events recalled above all fit well with a scenario whereby William is contacted in 1593 by his neighbor Richard Field who passes along to him cash for the use of his name so some great lord can get his poem published in London. William is mystified no doubt as to what it is about his name that makes it desirable to the great lord. Then the following year he’s contacted by another Londoner, this time by an actor, John Hemmings, who wants him to do the same thing for his acting company. Hemming and his Company are in a bind: questions are being asked about the authorship of the plays they’re performing. Having published several of these as a way to establish ownership, the fact that there was no author’s name on the title page simply ramped up the curiosity of the growing community of playgoers who interested themselves in such matters. They’ve got to come up with a name, and it can’t be an empty pseudonym, for the questioners will see through that in a minute and the questioning will only redouble in intensity. It can’t be the name of a Londoner whose life and abilities are too well known. It can’t be a real writer, for that has led to trouble in the past. The best solution is to contact the provincial wool-dealer’s son whose name Oxford used recently to get Venus and Adonis published. Following the holidays in early 1595, Hemmings arranges for a visit to his hometown in Droitwich, including a stopover in Stratford-on-Avon. Shortly after, William arrives in London in time to be identified as a payee for the Company. Hemmings finds him a room somewhere in St. Helen’s parish, Bishopsgate. He comes to London from time to time to see what he can get going for himself. He may actually be given various duties by the Company, they may even give him a walkon or a bit part to see if he can be trained as an actor (Hamlet’s father’s ghost has been suggested). Eventually, however, he makes himself obnoxious, as can be seen in Jonson’s portrayal of Sogliardo in Every Man Out. In 1596 he disappoints the tax gatherers in Bishopsgate, and either he or someone using his name gets into trouble at Bankside. In 1597 he disappoints the tax gatherers again, and we lose sight of him. He reemerges into the London records in 1612 as having roomed at times with wigmakers in northwest London near Cripplegate, c.1602. In the summer of 1605 he may also, on a trip into or out of London, have fathered a son on the innkeeper’s wife at Oxford. His father having died in 1602, his trips probably began to diminish in frequency and duration; surely by this time it had become apparent that he wasn’t going to get any more out the Company, or any other source, than what he was already getting. Most who have studied the matter see him as essentially retired to Stratford by 1612. To honor his father, who had been an important town official at one time, William orders a popular stonemason to make a monument which at some point is placed in Trinity Church. In 1616, faced with death, William keeps his promise to the Company by sending a message to his neighbor, Thomas Russell, who had been enrolled by Hemmings at some point as his replacement in dealing with William. By marrying Anne Digges, a neighbor of the Hemmings in London, Russell had become a member of the community who knew the truth about the Shakespeare coverup. Anne Digges was the widow of the scientist Thomas Digges, the son of Leonard Digges Sr., whose wife was the first cousin of the wife of Oxford’s tutor, Sir Thomas Smith. Their son, Leonard Jr, would contribute a dedicatory poem to the First Folio. As overseer of William’s will, Russell sees to it that bequests to several members of the Company are added to the already prepared will. William dies without ever telling anyone––with the likely exception of his wife––the true source of his income for the past 30 years. At some point following the death of Anne Hathaway in 1623, the memorial is “renovated” to look less like a wool-dealer and more like that of a writer. At this point the “incomparable brethren” Pembroke and Montgomery, in fear of losing their Court positions through the machinations of the Duke of Buckingham, rush the First Folio into publication. The word goes out that, all questions to the contrary, the true author of the Shakespeare canon is the otherwise unknown “actor” from Stratford-upon-Avon. But while this tends to prevent new questions from arising, it does nothing to quell the old ones, which continue to get passed down from one individual to another, until the horrors of the Civil War wash the slate of memory clean. Though questions continue for several generations, the knowledge of the truth fades as the generation that knew Oxford dies and their children die, eventually turning what had been a certainty into a rumor, one that gradually, since it’s impossible to substantiate, simply fade to zero. There are, however, in the annals of the second Earl of Oxford of the second creation, his wife Henrietta and their friend the engraver George Vertue, hints that the story may have lasted at least until their time. This can be seen if through a glass darkly, in images created by George Vertue that may have kept the story alive for those who still believed it. I find much of what you say very plausible. I was thinking that the one instance that just doesn’t ring true is that de Vere would have to pay Shaxpar money to use the pseudonym Shake-Speare. Shaxpar at that point was a nobody who couldn’t read. He never would have encountered the poems or plays with a name similar to his affixed to them. De Vere could have easily used the name Shake-Speare without ruffling Shaxpar’s feathers. But you are suggesting that De Vere needed an actual body, an actual person that people could point to as the author of the plays. If that is so, why then was “Shaxpar” able to get away with so much inflammatory rhetoric in his works when other writers of the day were being thrown into prison or having body parts chopped off? Roger Stritmatter wrote the following in the Summer 2006 issue of Shakespeare Matters. This article helps confirm the theory that certain contemporaneous writers acknowledged Shakespeare as a nom de plume. as a real person, but is instead invoked as linguistic construct. Notes and Queries, March 2006, 72-74. Traupman, John C. The New College Latin & English Dictionary. New York: Bantam Books, 1966.